The following is important information regarding the 2017 season for both junior and senior players. All new and returning players are asked to attend a brief meeting on Wednesday, September 6th, at lunch, in the main gym. To be eligible to play junior, players must be born in 2002 or 2003. Returning players who do not have equipment or those that attended the spring camp may pick up their equipment on Wednesday after school. The first practice will take place on Thursday, September 7th at 3:15 on the football field; this will be a non-equipment practice. Full equipment practices will begin on Friday, September 8th. Players and parents can download, print and complete the consent form below to get a head start on the season. For more information, please see any Junior coach (Mr. Battistel, Mr. Honeysett, Mr. Bevilacqua, Mr. Lane or Mr. Madge). Full practices will commence on Wednesday, September 6th at 3:15. New players are welcome. For more information, please see any Senior coach (Mr. Marcon, Mr. Pearce, Mr. Skinner or Mr. Diebel) as soon as possible. *The season schedules have just been finalized and will be distributed once they are fully approved. The first Senior game is tentatively scheduled for September 16th while the first Junior game is tentatively scheduled for September 21st. The following is important information regarding the 2016 season for both junior and senior players. All new and returning players are asked to attend a brief meeting on Wednesday, September 7th, at lunch, in the main gym. To be eligible to play junior, players must be born in 2001 or 2002. Returning players who do not have equipment or those that attended the spring camp may pick up their equipment on Wednesday after school. The first practice will take place on Thursday, September 8th at 3:15 on the football field; this will be a non-equipment practice. Full equipment practices will begin on Friday, September 9th. Players and parents can download, print and complete the consent form below to get a head start on the season. For more information, please see Mr. Battistel, Mr. Honeysett or Mr. Bevilacqua. Practices will begin Monday, August 29th from 3:00-5:00. The basement will be open at 2:40 and practice will commence at 3:00 sharp. Practices will run through Thursday, September 1st. 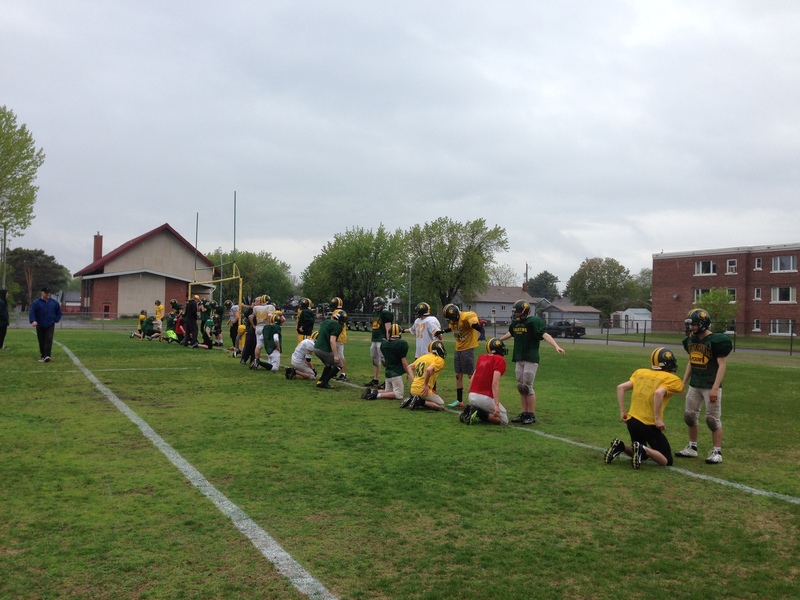 Normal practice schedule will start the following week, after Labour Day. New players are welcome. For more information, please see Mr. Marcon or Mr. Pearce. *Please note that fees have gone up this year to $120. This is to offset an increase in prices, as well to cover the $15 athletic banquet fee the school will charge each athlete this year. This means that every football player will automatically be eligible to attend the awards dinner in June. **Also, new SSSAA guidelines require that all athletes in high-risk sports undergo baseline testing prior to the commencement of the season. 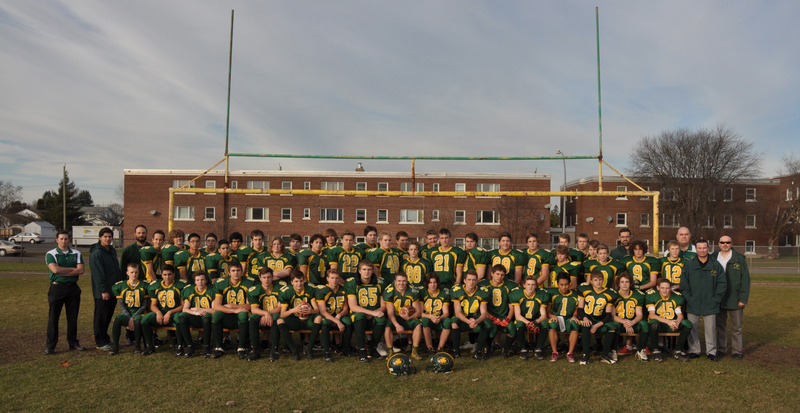 This includes all Grade 9s and those new to football in Grade 10, 11 or 12. Tests are administered by the LU Concussion Clinic. We are now into 2016, there is quite a bit of snow on the ground and it seems unusual to be talking about football. Our season review is a bit late this year, but better late than never. Our junior squad had a very successful year. The juniors boasted their largest numbers in quite a long time, carrying 49 players on the roster at the end of the season. 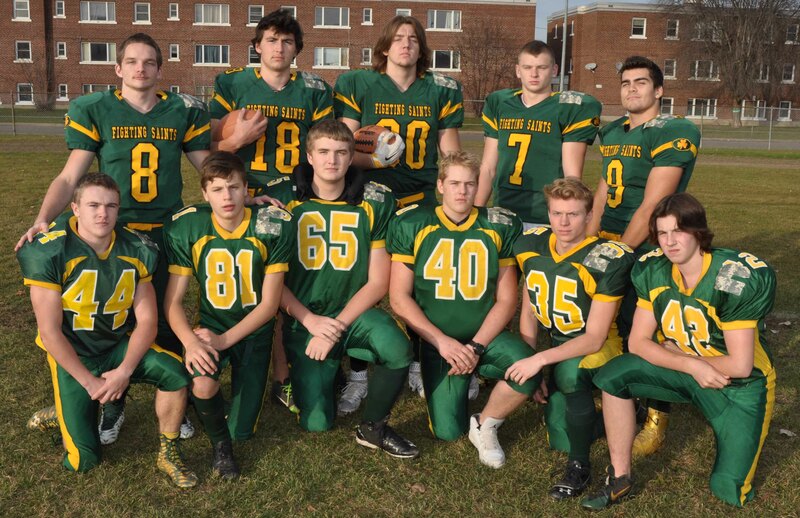 Half of these players were Grade 9s, which speaks volumes about the success and popularity of our program. The juniors finished the regular season at 3 and 2, locking up third place heading into the playoffs. After a decisive win over a tough Superior squad in the quarterfinals, the juniors had to face second place Hammarskjold in the semifinals. The team played their best football of the season that day, but fell 15-13 after nearly pulling off the upset in the final seconds against the Vikings. 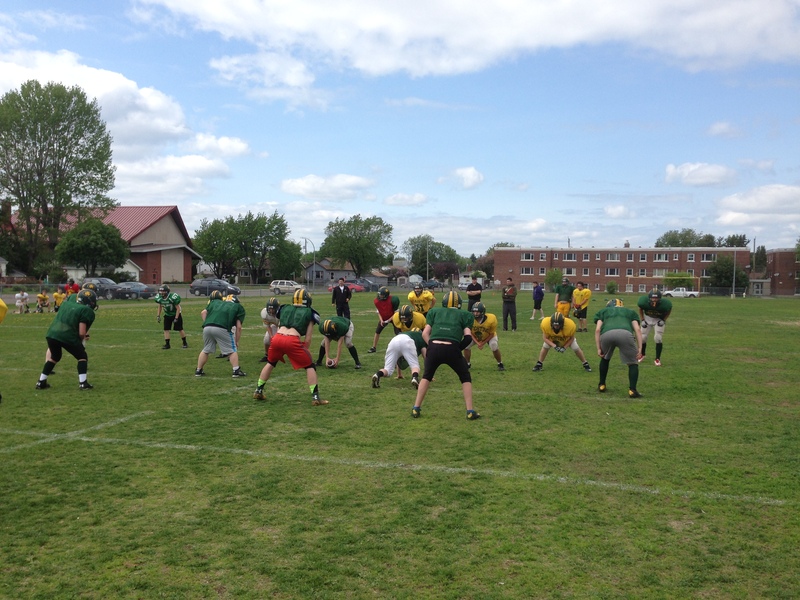 With upwards of 25 potential returning Grade 9s, the juniors should be posed to be in contention for the SSSAA crown once again. Our senior squad likewise had a very successful 2015 campaign. 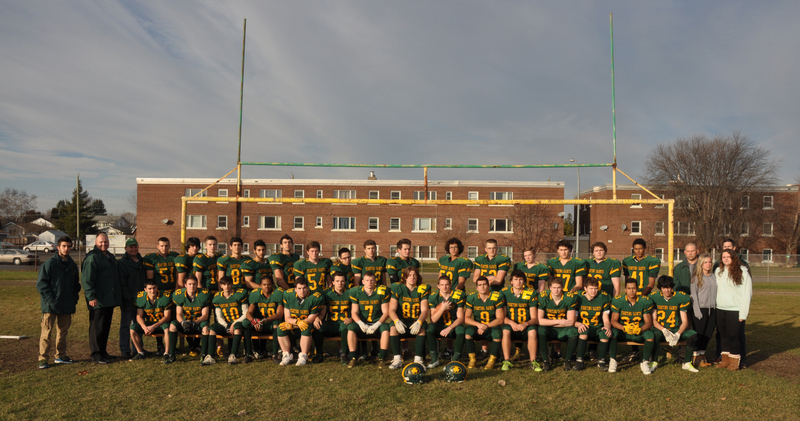 With quite a number of Grade 12 players and a solid core of Grade 11s, the seniors were regarded as one of the top teams in the league. The seniors headed into the playoffs in third place, finishing tied with St. Ignatius at 5 and 2. The semifinals pitted them against those same Falcons; the outcome was bitterly contested for most of the game, until St. Ignatius pulled away in the second half. The seniors also have quite a number of returning players and should again be regarded as one of the top teams in the league this coming season. This year our teams lent their support to another of worthy causes. In October, our captains sported pink “C’s” as it was breast cancer awareness month. 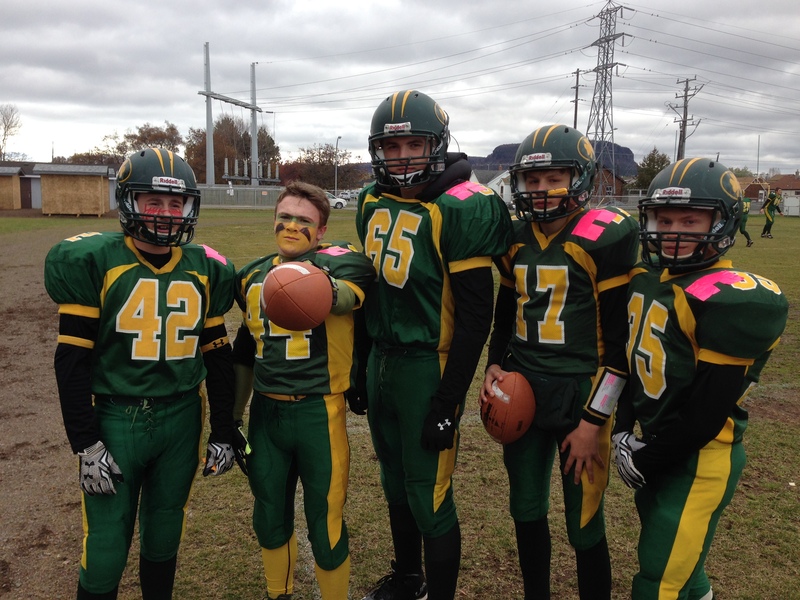 For the November playoff games, the captains wore camouflage “C’s” in honour of veterans month and Remembrance Day. Our program has been very fortunate over the years to have a number of our players move on to play football at the university level. In the spring of 2014, we had our first alumni drafted into the Canadian Football League. 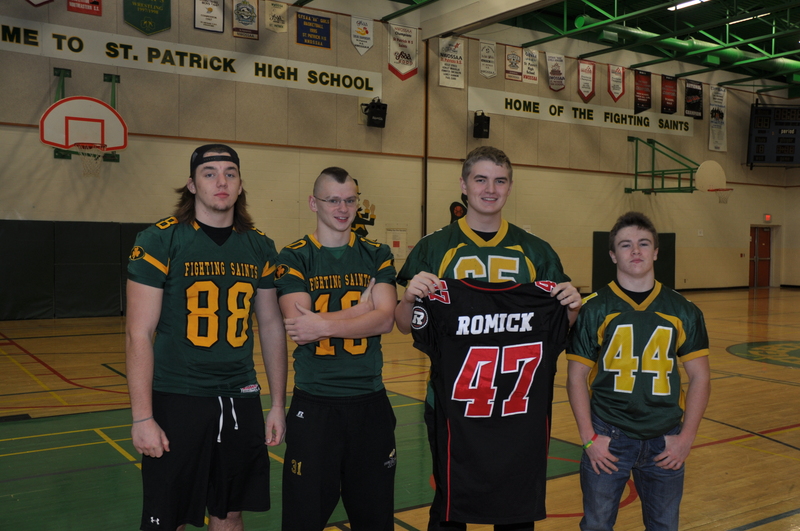 Nigel Romick only began playing football in Grade 10. 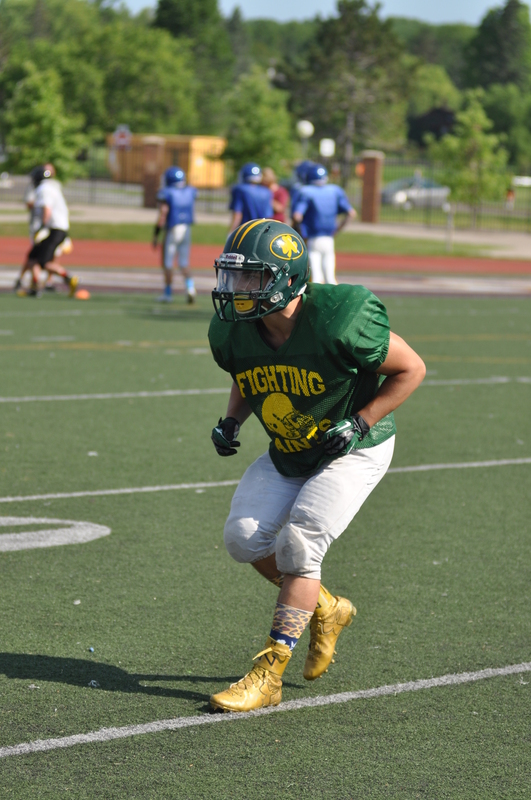 He very quickly established himself as one of the best tight ends and defensive ends in the city. His hard work earned him a scholarship to St. Mary’s University in Halifax. Nigel’s size and talent made him a force for the Huskies’ defence; in his final season he tallied 27 tackles and 6 sacks. 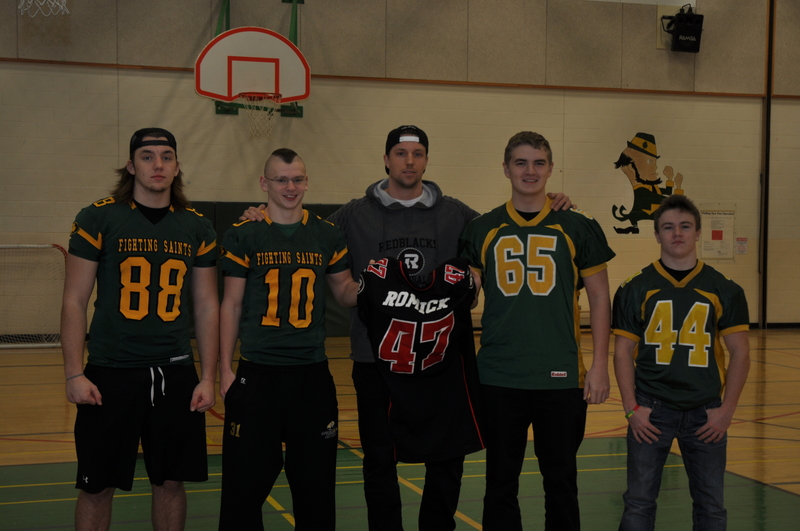 That output led him to be selected as the 23rd overall pick in the CFL draft by the Ottawa Redblacks. Nigel has always been very willing to give back to the school and our program. Over the Christmas break, he came to visit bearing a special gift; a game worn jersey. Nigel took some time to address to the players and coaches who were present, speaking about how his time at St. Pats and football changed his life. Senior team captains Kellen Steudle and Cody Baranyk, along with junior captains Calen Fennell and Erik Steinhaeusser accepted the game jersey on behalf of the program. It will eventually be displayed in the school hallway alongside other notable St. Pats alumni such as Katie Weatherston, Carter Hutton and others. You can read and watch the media coverage of the event via these links: Chronicle-Journal, Tbnewswatch and TBT News. Nigel Romick with the team captains. With the new year upon us, there are a number of important events coming up. On Tuesday, February 9th we will commence our off-season workout program in the weight room. Then on the following Tuesday, February 16th, members of our junior team will be at Pope John Paul senior elementary school to promote our program. The next day, February 17th, is the annual school open house for prospective Grade 8 students. Fighting Saints football will have a booth set up and both coaches and players will be on hand to answer any questions about the upcoming season. The following is important information regarding the 2015 season. All new and returning players are asked to attend a brief meeting on Tuesday, September 8th, at lunch, in the main gym. To be eligible to play junior, players must be born in 2000 or 2001. Returning players who do not have equipment or those that attended the spring camp may pick up their equipment on Tuesday after school. The first practice will take place on Wednesday, September 9th at 3:15 on the football field; this will be a non-equipment practice. Full equipment practices will begin on Thursday, September 10th. Players and parents can download, print and complete the consent form below to get a head start on the season. For more information, please see Mr. Battistel, Mr. Honeysett or Mr. Bevilacqua. Practices will begin Tuesday, September 1st and run through Thursday, September 3rd from 3:00-5:00 (ish). The basement will be open at 2:30 and practice will commence at 3:00 sharp. Normal practice will start the following week, after Labour Day. New players are welcome. For more information, please see Mr. Marcon or Mr. Pearce. 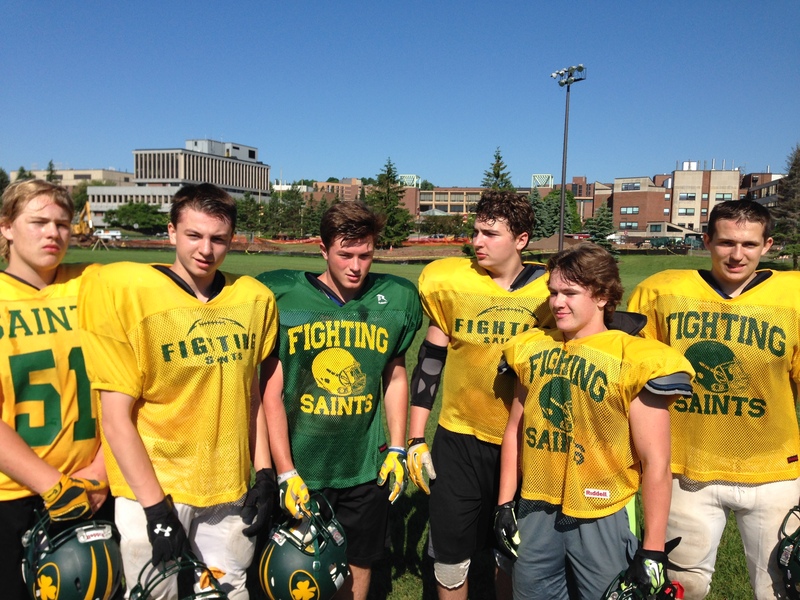 It was another successful spring of football for the St. Patrick Fighting Saints. 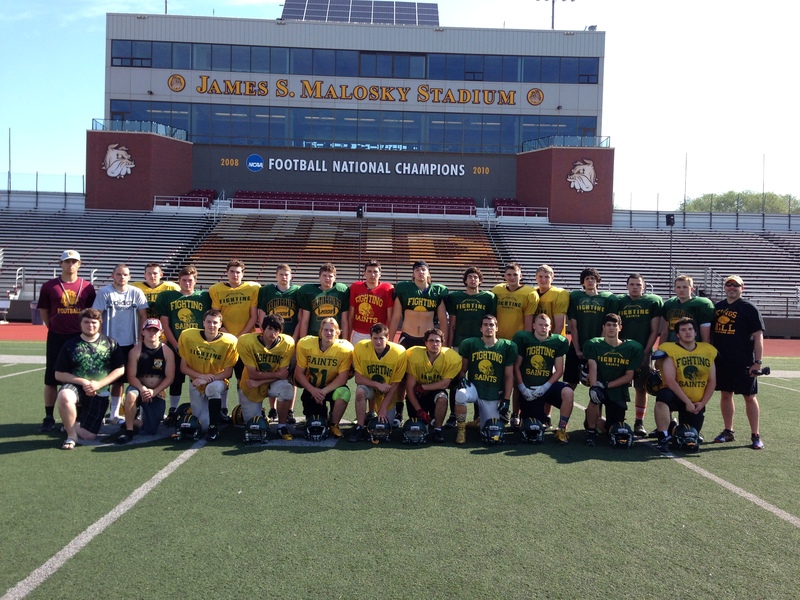 The arrival of June marked our annual junior and senior camps, as well as another visit to the University of Minnesota-Duluth (UMD) for their team camp. 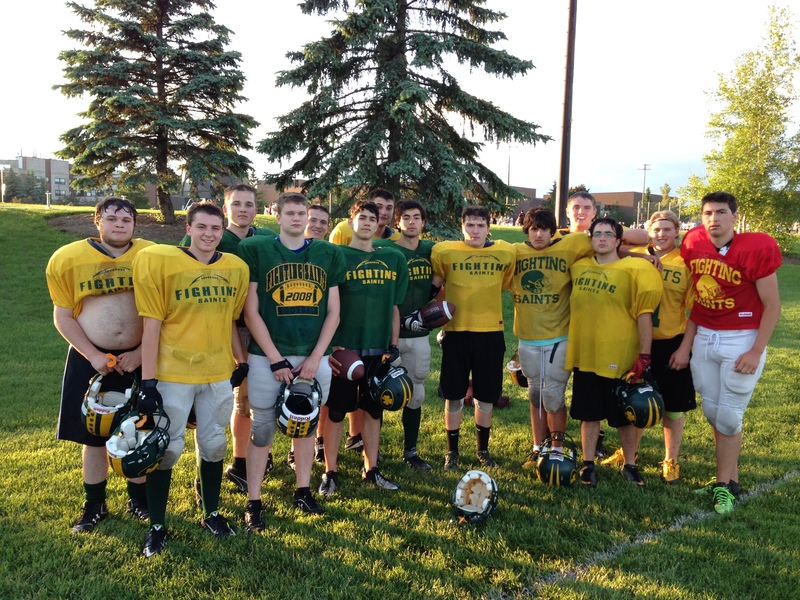 The senior camp opened on Thursday, June 4 and then continued the whole next week culminating in a multi-team scrimmage at the Fort William Stadium on Friday, June 12. Besides the mandatory preparation, it was an excellent primer for the upcoming trip to UMD. 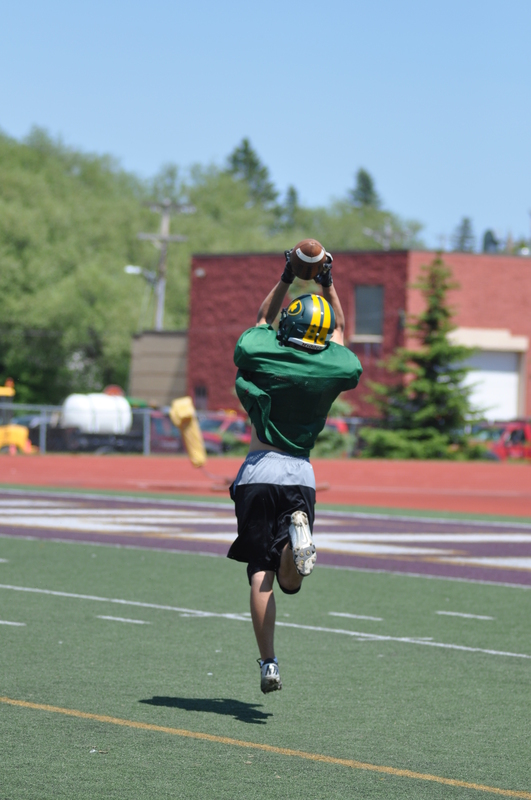 The two day junior mini-camp ran Monday, June 15 and Tuesday, June 16. 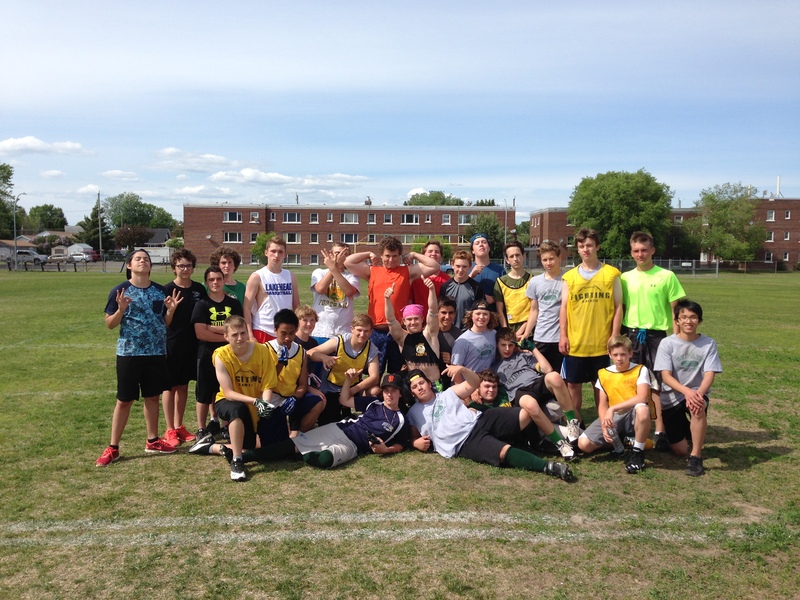 It was very well attended, with over 30 Grade 8’s and 9’s present, many of whom had never played football before. 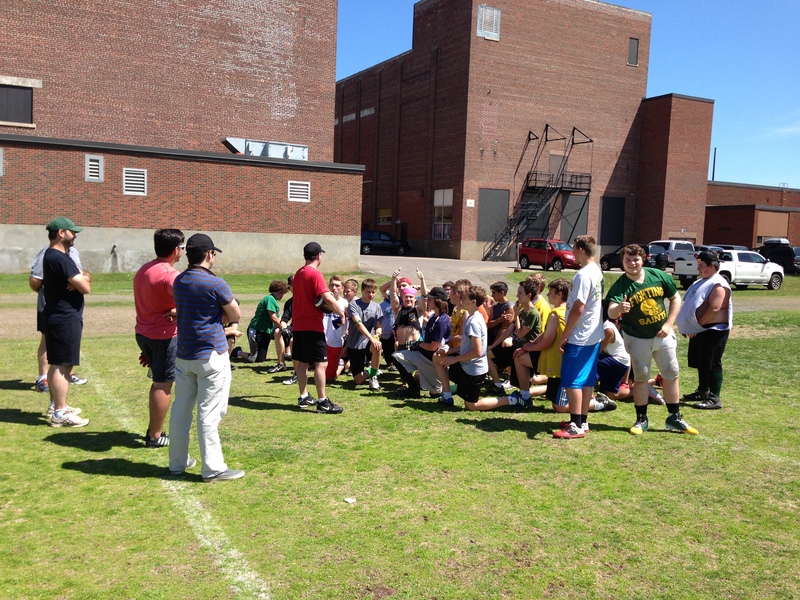 On Thursday, June 25 our program headed south for our fifth trip to the UMD team football camp. The squad consisted of 25 Grade 9, 10 and 11 players plus 8 junior and senior coaches. We would be joined at the camp by three other teams from Thunder Bay; Churchill, Hammarskjold and our sister school and chief rivals, St. Ignatius. We left bright and early at 7:00 for the 3.5 hour trip to Duluth and after a brief stop for lunch, proceeded to the UMD campus to check in. 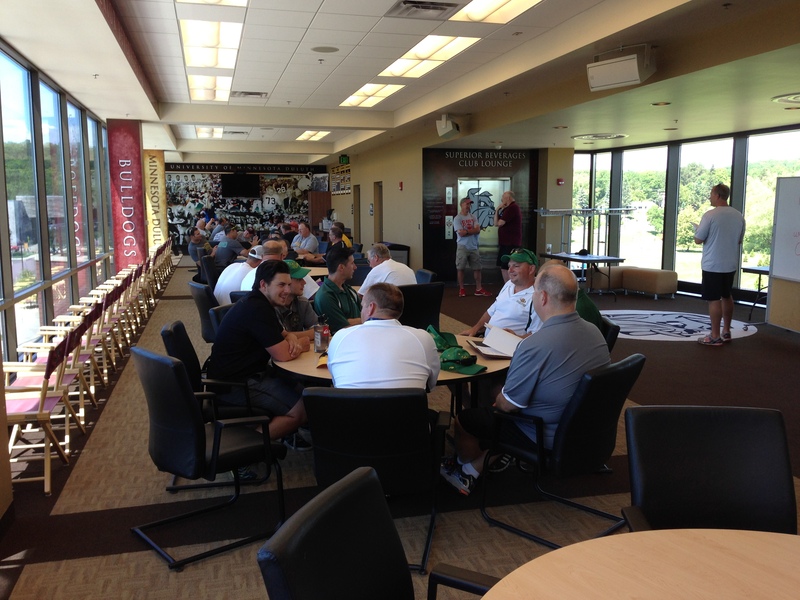 While the team were directed to their rooms by their UMD chaperone Taylor, the coaches had to quickly get to their rooms and then hustle to Malosky Field for the first of several coaches meetings. By 2:00 the players were on the field for team and individual workouts. After a supper break, the players got to experience their first scrimmage against one of the many American teams in camp. I think everyone was excited to play some real football! 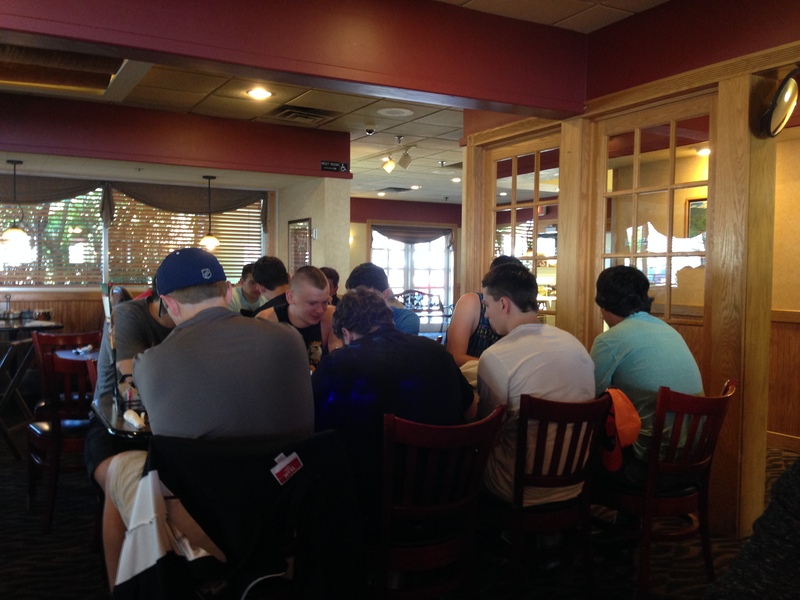 Day two, or the “killer day” began at 7:00 for the players with wake up and breakfast. They would need the fuel for 3 sessions of football; morning, afternoon and evening. The day was again filled with team, individual and scrimmage times, highlighted by the first “King of the Hill” contest of the camp. At the end of the evening session, all the teams participated in an interesting contest. Each school was required to select 10 players to compete, 3 of whom had to tip the scales at over 220 pounds. All 10 then had to clear a 5 foot high jump through the use of team work. Our boys put in a good showing, getting down to the last jumper, but that bar was just too much for one guy to surmount. 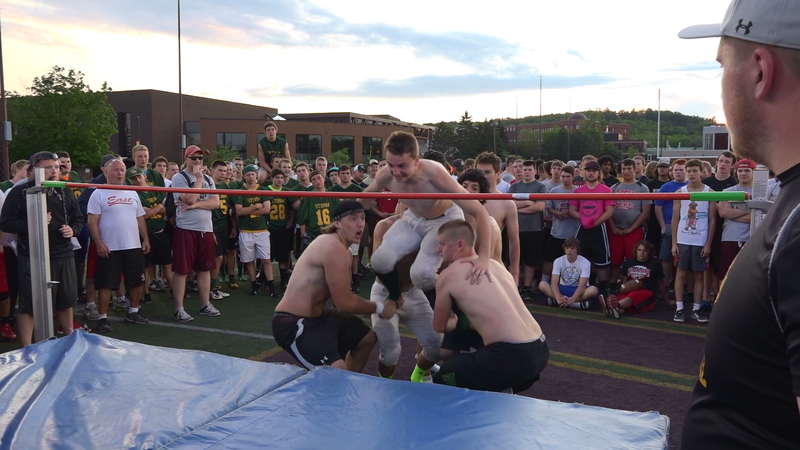 High jump contest, June 2015. The final day was going to be the shortest, but the most intense. After breakfast, the players were off to the last round of individual workouts, followed by more scrimmages and another King of the Hill contest. It was sad to see the camp come to an end, but after all of that football, everyone was physically and mentally out of gas. Coach Curt Wiese and his staff once again put on an amazing camp and we look forward to attending again in the future!